Fantastic Waterside Condo in Cen. London, quiet private square & River Views. 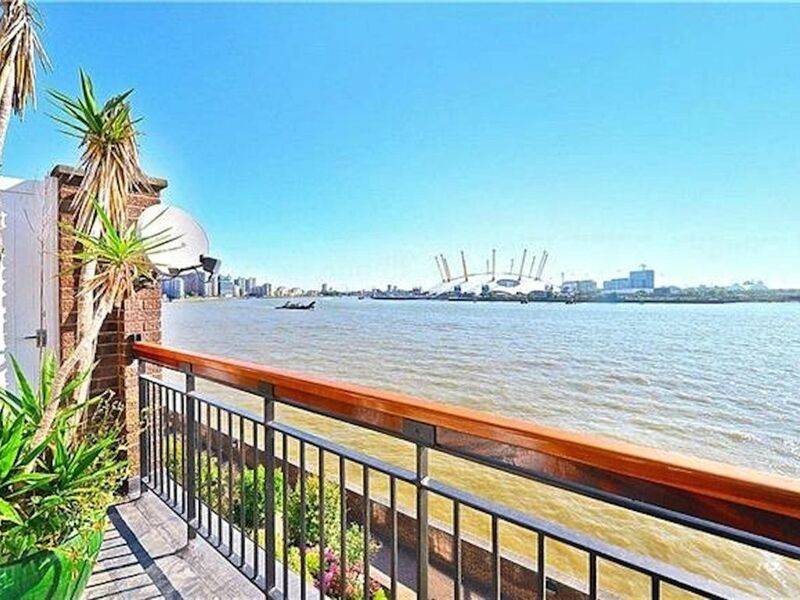 Tranquil 3 bed, 2 bath, 4* ETC home, with balcony views of The 02 Arena'. The front of the property has suburb River views over the River Thames, there are no passing cars, no fumes, no boy racers, etc., just tranquil tidal waters teaming with fish and wildlife. The occasional passing ship or cruise liner slowly sails by, as does the River Shuttle bus on route every 15 minutes East to Greenwich, or Westminster up river. Catch this at Canary Wharf Pier. The other side of the property has green lawns in a residential Private Square filled with mature rose bushes, many trees and seating, affording the most charming and private of holiday locations. Squirrels and the neighbourhood cat will keep you company. Here each house has it's own generous private parking space, off street, adjacent, included within your booking. The house has 3 double bedrooms, 2 of the beds are king sized and one bedroom has 2 single beds, these 3 bedrooms are supported by 2 bathrooms. The top floor bedroom has a bathroom en-suite with a large bath with overhead shower, a bidet, a marbled vanity unit with wash basin and a toilet. At the other side of the room is the large bed and a private balcony overlooking the River Thames. There's seating and a table on the balcony so you can relax and while away the time watching the changing watery scenery, perhaps sip something cool. You will see the cormorants, gulls and passing ships. The sailors on the Navel vessels often line up along the length of the ship in their formal dress to welcome and salute the docks as they sail past. Quite a sight really. The international exhibition centre “EXCEL EXHIBITION CENTRE” is 12 minutes away by either train or car. We have many returning guests who come each year to visit this centre. They get to know the area, the smugglers inn nearby 'The Gun' which is 16th Century and nowadays a thriving restaurant. They get to know the local pubs such as 'The George' at Crossharbour station. There are so many fine restaurants, we like 'The Gun' as it's very good and only 100 meters walk away from our garden gate. Along and around the waterways at Canary Wharf are so many good places to dine with a choice of international cuisine with notable Chefs. There are places for children too and of course you can dial up for free delivery of Indian, Mexican, Chinese, Italian, Thai., and a host of burger and pizza places. The house is nearby the trendy, busy financial world of Canary Wharf.,with it's restaurants, many shops and vibrant nightlife. The house is fully insured for holiday lettings, provides excellent light and airy accommodation for up to 6 people, maximum. The rental rate given is for 4 people only and varies by £100 for each additional person to a maximum of 6 people. There's FREE WIRELESS INTERNET, PRIVATE PARKING and a full satellite package supplied by the 40' HD the open plan lounge. So whether your interests are Australian Cricket, Wimbledon Tennis, a Premier football match, International channels in various languages, or you wish to watch the news from where you come from, you can record it and watch it when it suits you. A 2nd TV is in the 3rd bedroom on the 3rd floor (not satellite). As would be expected given the close proximity to the City, there are plenty of excellent local restaurants to suit most palates. Nearby, within easy walking distance, you will find Billingsgate Fish Market which ensures the very best of seafood, all over London. Well worth a visit as there is a freezer unit in the house for your purchases. Opens to the public at 7.30am, till .30am. An excellent Indian Restaurant is within easy 5 minutes walking distance and we have negotiated a 10% DISCOUNT for our guests. Also, a second Indian restaurants nearby South Quay train station, allows our guests a 10% discount. There is a 3rd Restaurant. full details of how to book these are given in the house. This house offers a special retreat in a quiet private square, with the outside of the square being the property frontage, overlooking the River Thames. An ever changing view from each of the 3 levels. On the first floor you will find the large long open plan living area with a picture window taking up most of the wall, overlooking the River Thames. In the centre of the living space is the dining area with strong solid wood seating and an oval glass dining table, seating up to 6 people. Then you have the kitchen area which has a breakfast bar with two high stools. The kitchen has a full sized dishwasher (we supply dishwasher tablets) a full sized fridge, a separate freezer cabinet, a washing machine which dries also, a double oven cooker with 4 hob plates plus a griddle side on the top. There's a large toasting area to the oven unit and we have a small toaster also, along with an electric coffee percolator, a microwave oven and all really that you would expect for a comfortable holiday home from home. The famous Billingsgate Fish Market is nearby for the best catch of the day! Need to get there for 7.30am. They close at 8.30am. The fish from here supplies the whole of London’s restaurants, from 4.30am each day. You can buy small quantities though to suit your needs after 7.30am. They also serve brilliant breakfast of fresh smoked haddock with eggs. For Groceries you will find all that you will need at our local supermarket which is 3 minutes walk from the house in Stewart Street.This opens at 7.30am each day and closes at 10pm., except on Sundays when it closes at 4.00pm. Then there are larger supermarkets such as the TESCO's across the road from South Quay Rail Station, this store is open till 11pm. A large ASDA supermarket is about 10 minutes walk. There is a large print map prepared for you with these facilities marked out. There are lots of local tourist attractions and a superb selection of speciality shops in nearby Canary Wharf. Here also you will find picnic areas in landscaped gardens with waterfalls and fountains, a very large selection of eateries and clothing shops. It's a very rich area, teaming with wealthy financial traders who live and work in the area. We have many fine Restaurants nearby, not least is the 16th Century Smugglers Inn, 'The Gun' which you can see from our garden gate, just a short 3 minute walk away. In the other direction from the house is a notable Indian Restaurant that allow our guests 10% discount off the bill. (Details in the house) There are others too who provide this discount. Indeed, with a thriving business community we have many good eateries to suit all purses, too many to mention here. Located in Zone 2 of Central London's Underground Network, it's the cheapest rail ticket for Central London's Underground, there's lots to do and see everywhere. Getting around Town: With so much to see, we have excellent transport arrangements. Traveling around is a breeze, literally. The River Bus operates during commuter hours every 15 minutes and there's also the Central London Underground, particularly the Jubilee Line. So one can be wisked off to pastures new, in minutes. We have 3 local rail stations in all. Nearby there’s Canary Wharf, Greenwich, The Tower of London and Tower Bridge. It's the cheapest tube fare for town and very easy to reach everywhere in town from one of 3 local train stations, all part of the Central London Underground Network. It all depends on which direction of town you wish to travel to. Also, there are Red London Buses, (Pick up point is right outside the square) Black London taxies, or the River bus which picks up from Canary Wharf Pier every 15 minutes. This is my favourite method.Travel up river to Westminster Pier, stopping at Tower Bridge Pier, then the Embankment (for the London Eye) or down river to Greenwich. (Royal Parks and Museums) The 3 local tube stations are 'South Quay' and 'Crossharbour' or 'Canary Wharf' on either the DLR Line or the Jubilee Line. both part of the Central London Underground Network. I must not forget our local “Boris Bikes”, so named after our flamboyant Major of London. It was his initiative to install these bike docks all over town, possibly every half mile you will find one. Just £1 buys you an hour’s bike travel. The first half hour is free, so if you are smart you could cycle for 25 minutes, park the bike, wait 6 minutes and then take another bike for the next phase of your journey. 30 minutes covers a lot of ground in busy London streets. Cars are required to purchase a ticket to cover the congestion charge of £8.50 per day. Consequently, there are less cars in town. There are clearly defined cycle lanes everywhere and its very popular. We can accept bookings online, by credit card, . Also, by English cheque or bank transfer. For a reference, we have been a a member of the English Tourist Council for 17 years, holding a 4* Certificate each year after an extensive annual inspection of the facilities and comfort level. So you can be assured that all is as it should be. To hold the dates you require, we take a £200 deposit and then the balance becomes due 2 months before your arrival. We supply our guests with a confirmation of booking document which confirms all the aspects of the booking and the accommodation. Nearer the time of arrival we supply our guests with general directions from each of London’s airports and main hub train stations. We hope you will get in touch, a quotation for your stay is quick and we would love to hear from you. Discount off the rates for returning guests. english, We can translate European.and any other language. Hello everyone, having worked in London from a young age, I grew accustomed to travelling in and around London and after a few years I chose to settle as a single business woman in this vibrant area of London. They were very exciting times with marbled skyscrapers popping up everywhere and new restaurants to try and new transport links. I drove into town each day and found that this was a convenient location with a wow factor of the river frontage. With off street private parking at the house and the area full of local attractions, this was indeed a find. Then I met my Partner, he lived in the Midlands of England, so I duly moved. However, not wishing to part with this lovely house the idea came to me to rent for short periods. Thus, I would have a foot in the area when I wished to visit. I have family in the area and so this arrangement has proved to be very beneficial to all, sharing the wonderful views and tranquil waters with my new and returning guests.Check out the Special rates apply for same month bookings, where dates are still free. This house struck me as soon as I cast eyes on it. I was not looking to move but immediately had to buy it. It has been a very happy place to live and now my guests can enjoy the ever changing river views and wildlife. My local housekeeper looks after it for me and we both work hard to ensure our guests are made as comfortable as possible. The English Tourist Council, inspect this property every year and grade again. A 4* certificate has been achieved every year for 15 years now. They check that the current regulations are being adhered to and holiday home insurance is in place and everything is as it should be for the Travel Industry. I have been a member of their association for 10 years now. toilet, combination tub/shower, bidet, Marbled vanity unit and the largest bath! The second floor bathroom has ex large double shower enclosure with a power shower. Newly fitted. Hand basin and WC. The third floor bathroom has the largest bath we could find with, an overhead shower. There is also a bidet, WC and wash basin set in marble, all included in this en-suite bathroom. This bathroom is set behind two double wardrobes which face into the bedroom. At the other end of the room there's a full sized balcony with outside seating overlooking the River Thames and all that is passing. From the bed you can view the Thames and all that passes, plus a flat screen 26' wall hung TV. The full balcony has two outdoor comfy chairs and matching table, so you can just sit, sip and watch the world pass by. Cooling fans are supplied for each room. This tall house is very airy having windows on both sides on each level, so the cool breezes travels and rises through the property. Central Heating with individual setting valves on each bedroom radiator. In the lounge area there is a heat setting adjuster for the whole house. A weekly change over of all linens are provided so no need to strip beds and wash sheets linens etc., during your stay or on departure. This is quiet and easy to use with full instructions for each program provided in the leather file. This machine dries also. See the instructions manual for the different programs. The washing machine is a dryer also so you can set up and leave your clothes to wash/dry while you are out. The time to wash and dry the load is clearly shown on the front electronic panel. One bath and one hand towel are provided per guest. Changed weekly for clean supply so need to wash them. We clean the general areas, weekly, and change over all linens at that time. The living room is open plan adjoining the kitchen via the breakfast bar, then the dining section and then the lounge section. 35 feet long in all. So you may all see each other and be involved. Easy to use controls and quiet. Cleaning tables supplied. 3* Under Breakfast Bar Counter. Full size. 4 hob plates and side griddle plate section. There are two ovens, they work independant of each other. Above are 4 hob plates, a large toasting rack and a side griddle tray for pancakes/eggs. Electric Percolator type plus an on hob Continental coffee pot. A full sized oven toasting rack plus a separate stand alone electric 4 slice toaster. Sugar, tea bags, coffer instant and filter. salt and pepper, Olive Oil. All white china, as can be expected. Tea pot set with matching sugar pot and milk jug. Soup bowls and all you would need. All utensils. Dishwasher, double oven, 4 hob plates, toast rack, washing machine/dryer, fridge, freezer, breakfast bar, microwave, Coffee pots, stove and electric filter percolator coffee pot. Everything in fact. OPEN PLAN LAYOUT. Seating for six people, plus a bar stool at the breakfast bar for quick eating on the go . Supplied by BT remotely, so no problems. Supplied by the TV, there are some 10 channels that cover Rock, Country, Soul, Reggae, 50's 60's and top of the charts. As part of the satellite package there are many film channels to scroll through and choose. Some popular novels, cook books and travel guides, are provided. Area guides. We supply playing cards and a few other games, such as chess. Books, travel brochures. Area maps. See the TV's Stereo section for full selection of many music channels. Full details in the house as to how to access these. Programs can be prerecorded for later viewing or listening. The TV package includes a library of films, old and new, to choose from. The TV package provides these. We have a small front garden to the front of the house, before the Thames pathway. Mature plants and grass, garden path and gate. There is a full sized balcony overlooking the Thames which has outdoor Iron chairs and table so sit back and enjoy something cool to sip. Watch the passing ships and cormorants fishing. We have annual canoe races, private sailing craft are allowed, best to go out with one of the local clubs. Just outside the square you will find a row of cycles which are available for hire.£1 per hour and just dock it somewhere else in town. There is sculling, particularly at weekends. Then there's the "Rib". Fast speed boat racing past the house. Water proof clothing provided. Not for the faint hearted. Full size balcony off the top floor bedroom, can be enjoyed. Seating for two and table provided. Plus, the extensive residential gardens at the back of the house. In view from the house. There is a small private terrace and a front garden and the private square has mature rose gardens and seating. In the summer months some of the residents have barbecues and all are welcome. Jet Ski Bikes at St George's Dock. Hire the equipment from the club there. Or watch the racing. We have a driving range 2 kilo meters away and a golf course 3 km away. Booking required. Having three storeys, this property is not suitable for the elderly or disabled person who may have difficulty with the 3 stair levels. Available at the local hotels, for a small fee. These are available at the local hotels, for a small fee. Also, SPA Facilities and beauty Treatments. Locally there are communal swimming pools for the local residents to use, for a small charge. The large local hotels allow our residents to use their spa facilities for a small daily fee. There are many sporting activities held on the River Thames. We have sailing clubs, rowing on Saturday morning, listen and you will ear the cox calling to the crew. You can go motorboat racing and jet skiing, check out the local newspapers given out free at Canary Wharf for whats on. We also, have free shows on large screens of special concerts, London Opera,(Covent Garden) sports events( Olympics) etc. (The Queens Jubilee was filmed free) (Wimbledon Tennis)You would find a place on the grass to sit and may be, be provided with freebies. Bars all around and a very congenial atmosphere, all at Canary Wharf, a short walk away. This little place on the water outdid itself. Great location only 14 minutes to the DLR Canary Wharf take the Jubilee line to anywhere. The master bedroom overlooked the river,Thames . hope you like steps,cause there are 3 stories of them. Extremely clean, and quiet. I highly recommend your stay here. Remember to bring electrical adapters,they provide a couple but you need them in London. Thanks Christine, loved the place. cheers! A lovely flat in a fantastic location! We were very happy and comfortable in the flat. There were 3 adults and 2 children, and we were all very pleased with our stay. Christine has made the flat very accommodating for families, including a portable crib. The location was fabulous; the tube was only a 10 minute walk, there was a great playground across the street, two small grocery stores near by, and the waves breaking outside the windows were very relaxing. The only complaint had to do with the air conditioning as this was not what we were expecting; we are used to this being actual cool air through vents, not simply oscillating fans. Thankfully the heat wasn’t unbearable and there were only a couple of warm nights. Overall, we were very happy with our stay and would definitely stay there again! Loved, loved, loved the location! Clean, great location and Christine was fantastic to work with! There was a WIFI issue upon arrival which she promptly got repaired! Loved the view and everything about the flat! We will definitely stay here again! Bus transportation is within a 3-4 minute walk from the house. Between riding the bus, taking the tube or train.....it was better than any ride at Disney in the USA. I see no need to have a vehicle in London....especially if you are on vacation. The breeze off The River Thames kept the house cool all the time. Enjoyed being able to walk from the house down to The Cutty Sark via the underground tunnel. A 20 minute stroll. Ah...the pubs....but that is another story! We were three (3) couples in our 60's+ from the USA on holiday. We had planned to cook-in some days, but because of our adventures every day.....we only had breakfast. If you are looking for a quiet, clean and convenient spot.....YOU JUST FOUND IT! Staying at the Isle of the Dogs was very accommodating and convenient for me and my family. For the 5 adults it gave us plenty private space when we needed it and a good common environment we could all come together for meals and entertainment. Top floor of the town house had a patio which was great for me to just sit and watch the water and boats go by. Short walk to the DLR line, coffee shops, and dining. One stop from Canary wharf (central hub to more dining, mall, shopping and business/residential district) to which we could get to anywhere in central London. Grocery store right across the street. Can't say enough about the conveniences. Although it was an older unit it was very nice and comfortable as well. Loved staying there. I would do it again and highly recommend it. Bridge, The Tower of London; The Royal Parks and London Mseums and much more. There's easy access to "Excel", the International Exhibition Centre as well as London's Theatre land. A romantic hideaway on the River for honeymooners; nearby the famous Billingsgate Fish Market; Bermondsey Antique and food markets; "The O2 Arena" concert venue which is in view from the house across the River. This house is a special location with spectacular river views of passing ships, cruisers, the wildlife and the occasional lost dolphin or whale! Just sit on the balcony overlooking the Thames with a glass of something to sip and relax, just let those cares drift away. Fine restaurants are in easy walking distance from the house as are the tube stations and shops, so leave the car behind. Other Activities: "The new Emerates Fly Drive" cable car ride from The 02 Arena to London City Airport and Excel, Romantic hideaway; Cruising; Wildlife; Leisure clubs ; Theatres;Museums;Gym facilities,parks and many markets. Bookings are paid for by credit card, direct with a minimum payment of £200 as a booking fee. The balance payment being required 2 mnths before your arrival. Discounted bookings are offered for same month bookings where dates are free. Generally, for 4 nights, the rate has to be amortised into the change over costs and is thus higher, at £250 per night ( for 4 night periods), fully inclusive. This can be for 3-6 persons, fully inclusive. For same month late bookings a 10% is deducted. The weekly rate quoted is for 2/3 persons., all additional nights, the rate would be one 7th of this rate per extra night.. Thus, for a week for 4 people the rate would be £1100, for 5 guests the rate would be £1200 and for 6 people, the rate would be £1300, all rates are fully inclusive. There is a security deposit of £200 which is refundable after your stay. These rates are fully inclusive and include parking, Sky TV package, Broadband, fast Wi-Fi. The house is self catering and is supplied with towels and bathroom toiletries. Our housekeeper prepares the property for you and returns each week to clean. On departure she visits to clean and prepare for the next booking. All we ask is that the personal areas like the kitchen and the two bathrooms are left clean and neat. No need to strip beds or vacuum floors. We offer a 10% DISCOUNT for same month bookings. All rates are fully inclusive,Wi-Fi., Internet, Parking, full satellite 40/HD TV. Self Catering. No pets are allowed . Six is the maximum number of guests allowed. All rates are for Self Catering and are Fully inclusive, The minimum period is 4 nights. The rate would be £250 per night, which is just £62.50 per person per night, based on 6 sharing this 3 bed house. For the period of 4 nights, the rate would be £1000 fully inclusive. £250 per extra night up to £1200 for a week. This is an inclusive price for 4 people. Cancellation: The Booking deposit of £200 is non-refundable. After 60 days prior arrival, refunds depends on a late booking being found.